These beautiful beach ornaments personalized to make them perfect celebrate a wonderful family trip to somewhere special. 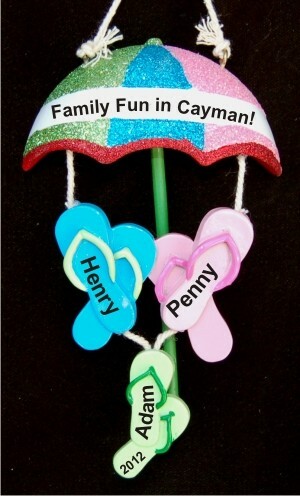 This dazzlingly colorful beach umbrella for 3 personalized Christmas ornament will look great wherever you display it. All of our beach ornaments personalized for you are lettered by hand in an artistic font. The beach umbrella for 3 Christmas ornament personalized for a special family will arrive in our posh, pretty velvet gift pouch. Remembering Cabo Dec 28, 2014 Kelsie A.